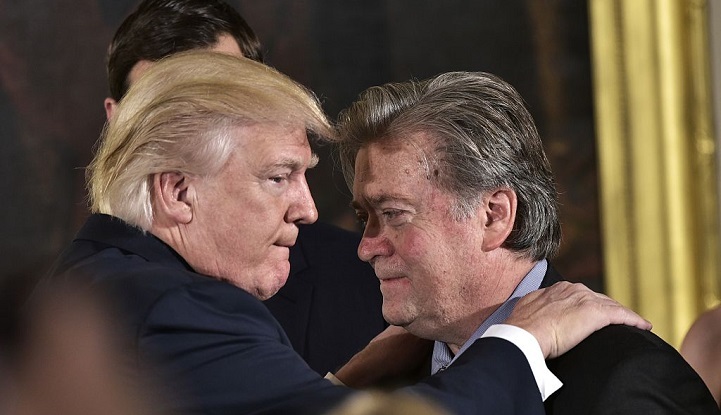 President Donald Trump and Senior Counselor to the President Stephen Bannon. A campaign finance watchdog said Wednesday that chief White House strategist Steve Bannon may have illegally benefited from spending by a pro-Trump super PAC while he led Trump’s presidential campaign. “As a result, as Bannon worked for the Trump campaign without pay, he continued to benefit, directly or indirectly, from the estimated $267,500 in payments that Make America Number 1 made to Glittering Steel LLC after or around his officially joining the campaign,” wrote the Campaign Legal Center’s general counsel, Larry Noble.